Goodreads: From their first day of college orientation, Pen, Cat and Will seemed born to be close friends. Eventually though, Cat's decision to marry an unpleasant mate had loosened their magical bond and without its center, the group had drifted away from each other. Now, six years later, when Cat emails her former cronies, asking them to join her at their college reunion, they cannot resist. Whatever nostalgic dreams the pair nurtured, however, dissolve when they are forced to confront a dangerous situation in which everything they believed about themselves and each other is brought into question. 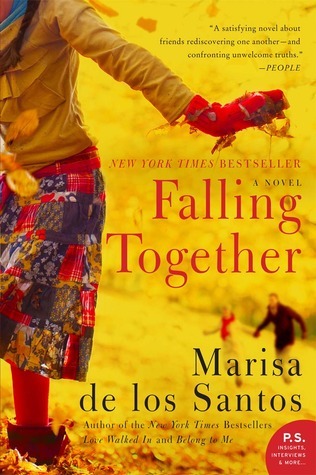 Kritters Thoughts: From the description of this book, I wasn't quite sure what I was getting into and this was my first trip with Marisa de los Santos, after reading this book I will definitely be reading her collection and looking forward to more! Told from Pen's point of view, I didn't realize until the end how she saw life and their tri-friendship through rose colored glasses and avoided seeing some of the negative moments in their friendship. Although the reader only learns of Cat in the past tense through the years of the friendship in moments of reflection, each character was distinct, but I could still see the ties that bind these three together. The characters that surrounded these three had lives of their own and helped fill the story, at times I loved them more then the central three. The other small point that I loved about this book is that the years where the characters were apart - they had experienced some similar life experiences: deaths in the family, loves lost or found and change in what mattered most to each - these things helped to see how they would be when they reunited. Throughout the book I kept thinking about my friends from my past and how different we are no as we were in high school and college - I am still friends with a few, but we have grown with each other, while others have drifted as we grew apart. I am glad this book made me take a moment and reflect on those friendships that are still very close and in my heart. Hmm, I'm intrigued by the rose-colored view of one of the main characters - that can certainly make the events of the story appear differently than they actually occurred. I love complexities like that!